Hubby and I love the salty and cheesy taste. 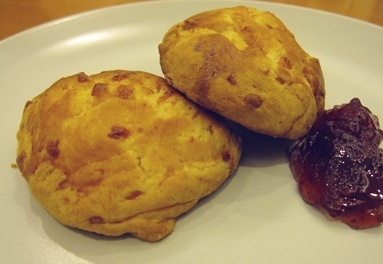 So with the packet of shredded Cheddar cheese in my fridge, I made some Cheese Scones and had them with jam for today's breakfast. Half-way through, I realized the recipe called for grated, not shredded cheese. I was too lazy to further chop up the cheese, and so used it as it was. The texture was not compromised and we liked its lightness and fluffiness. I used half the portions for my bake and yielded 20 scones. You may add more cheese if you prefer a cheesier taste. 1) Cream butter and sugar at slow speed for 2-3 min, or until blended. Add egg and continue beating at slow speed to combine all ingredients. Stop beating, scrap the mixing bowl to dislodge any butter residue at the side and bottom of the bowl. 2) Combine grated Cheddar cheese with self raising flour. With low beating speed, blend in the cheese and flour mixtures in stages. Pour in 230 gm of milk immediately after mixing the flour. Beat till all well combined. 3) Remove dough from mixing bowl, and place it on a floured surface/ kitchen table top. Let dough rest for 20-30 min. Extensive kneading is not required, just knead to form a dough will do. 4) Sprinkle some flour on the dough before rolling out to about 1 inch thick. Flour a round/oval shape cutter of 1.5 inches in diameter (about half a palm-size) to cut out the dough. Flour the cutter constantly and tap it sharply so that it goes through the dough to shape the scones easily. Alternately, cut in squares with knife, and shape it round with bare hands. 5) Place scones on a lightly greased baking tray and brush the top of each scone with milk. 6) Place scones at middle rack and bake in oven preheated to 180°C for 15-20 min, or until golden brown. 7) Leave scones on a colling rack to cool before serving.